Oh blue skies! How we have missed you! The haze season recently came back to haunt us but fortunately (or unfortunately) at least this time it caught us more prepared than ever despite lasting what felt like forever. As we donned our masks looking like an army of Darth Vader, we all tried to make the most of it and live our lives the best we could. For us at LIME, it was definitely interesting to see so many brands leverage on this unique situation and launch marketing initiatives. 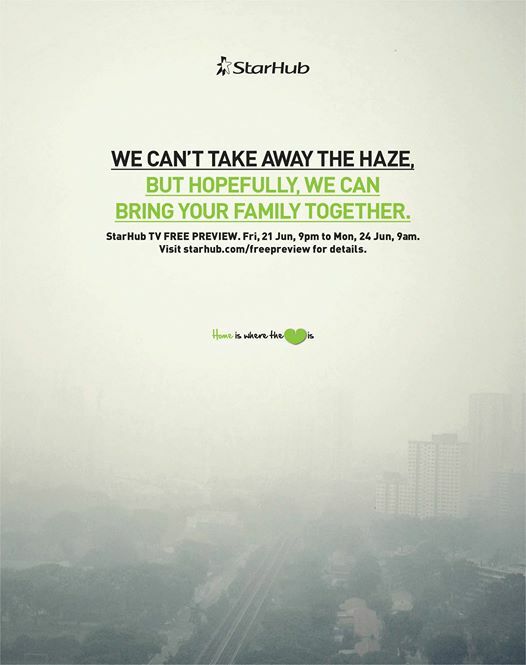 As the haze slowly transitioned to the oh so desired start of the rainy season, it is time for us to look back on a few examples of the marketing initiatives we saw during this crisis. The sports / outdoor fitness sector was said to have been one of the sector most affected by the haze situation, leaving personal trainers / bootcamps stranded and runners out of fresh air. As we saw people trying to escape from the smoke in a safe and cost friendly solutions and people fight for space in indoor gyms, Adidas chose to not only show its concern for its fans but to also support them in their wellness goals despite the hazy air conditions, by offering them free one-day gym passes at True Fitness (a health club) for all Singaporeans who own a piece of Adidas clothing. What a great move! No more excuses to avoid the daily healthy dose of push ups! With the government’s continued efforts to encourage citizens to stay indoors and hydrate themselves, the streets of bustling Singapore started to look like a ghost town with only a few warriors braving the haze to continue with their daily activities. Millions of people found themselves deprived of outdoors activities. Going to a bar or restaurant was definitely not an option, and at the same time the kids could not enjoy any outdoor games or play at the playgrounds. People were in desperate need of entertainment that they could safely enjoy in the comforts of their home. On Television – Starhub was able to identify and seize the opportunity to promote its paid-TV services by making all channels available for free throughout the weekend. Not only is this a good way to show its support for the government’s health advisory, but it is also potentially attracting new subscribers by showcasing the products it has to offer. Everybody wins! 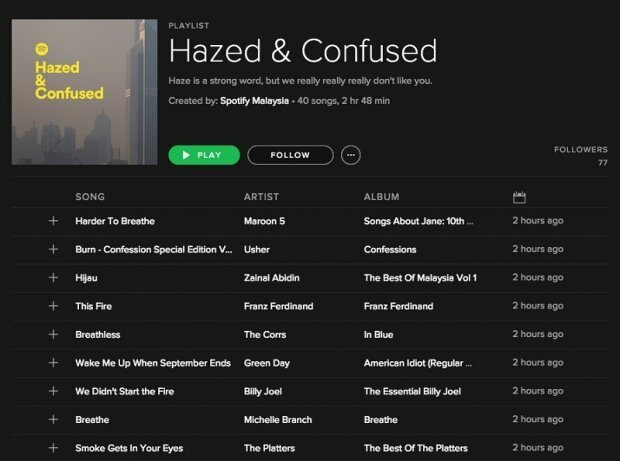 On Music – In the same vein, Spotify went for a more sarcastic take on this crisis and decided to help Singaporeans go through the ordeal with a smile on their faces by launching the “Hazed and Confused” playlist. Listeners were entertained with a haze-related selection of music – even for the mere duration of the playlist, to have a lighthearted laugh about the situation. Cheeky, very cheeky! Another company who understood exactly what to provide, how and why, was Uber. As people were looking for taxis to avoid spending more than 5 minutes on the streets and as the less-prepared were desperately searching for efficient masks, Uber jumped on the bandwagon and launched Uber Health. 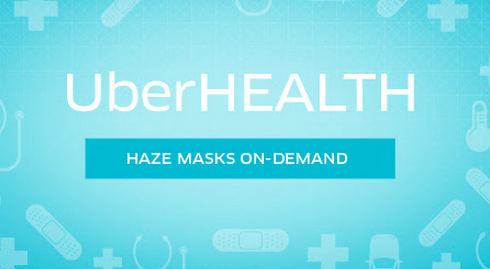 You simply need to request the “uberHealth” option on their app and they will arrive in minutes with a free health pack that contains 4 N95 masks. It was a unique opportunity to demonstrate their commitment to their customers as well as the wide network and efficiency of their drivers. The company scored a very positive word of mouth as the news spread like wildfire across all social networks. However the question remains as to whether or not the limited time frame (uberHealth lasted only until 7pm) was a constraint for the customers to enjoy this benefit. But all in all it is a big thumbs up to Uber! 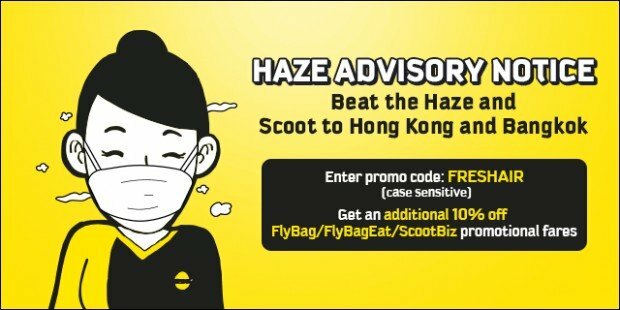 Scoot, never late to the real-time marketing party, “issued” a haze advisory notice to gently remind Singaporeans to “Get Outta Here!” Let’s just say they gave us the perfect excuse to get some days off work and travel away! The art for brands as we see here, is to learn to stay relevant and to successfully create an emotional bond with their target audiences – especially in crisis situation – with the right message at the right time. It is a risky move, which can either be deemed the best idea in the world or turned into a very ugly situation without the right message but that is the true beauty of real-time marketing. We’d love to hear more from you about the campaigns that you have encountered during the haze, so don’t hesitate to leave us some comments. As for the haze situation, we think it is time to do something about it!